The Beach House’s high-class architecture and contemporary style is enough to make you want to stay forever, but that’s not even close to where its amazingness ends. In fact it’s just the beginning, because on the 1.5 acres of property are out-of-this-world amenities, like unique bathroom tubs, indoor and outdoor rain showers, an infinity pool and Jacuzzi, a 12-seat cinema room, a game room, tennis courts, water equipment, plus an extra master-suite apartment. And it doesn’t end there! The Beach House is fully staffed with housekeeping, butler and concierge services, security, and some of Anguilla’s most sought after chefs who will serve food and drinks from morning to night. Can’t you see yourself on the upper sundeck, taking in the beautiful bay with an ice cold drink in hand? Luxury villa on stunning Meads Bay beach! The Beach House has a beachfront location and 1.5 acres of gated property on Meads Bay. 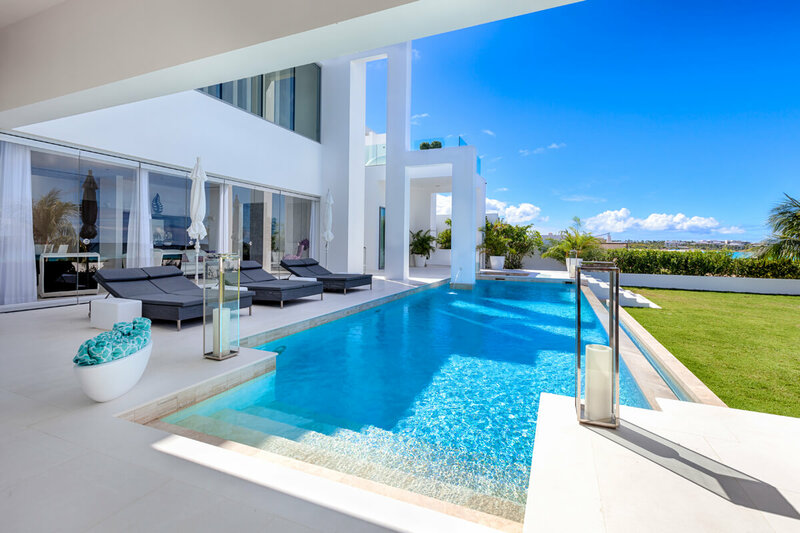 This villa’s stunning architecture and convenience to the beach make it an elegant, modern, and spacious choice for an Anguilla vacation. One of the villa’s most luxurious amenities is the 44’ infinity-edge pool and Jacuzzi. The pool is surrounded by a crisp white terrace with oversized loungers and umbrellas. A lawn sits opposite, and has a path leading to the beach. The covered veranda is attached to the pool deck, and shades al fresco dining and living areas. Upstairs, there’s an observation deck balcony with couches, loungers, and a glass barrier all around. Meads Bay has powder soft white sand and turquoise waters, and there’s rowing boats, kayaks, paddle boards, paddle boats, and snorkeling equipment available for villa guests. The Beach House also has a private tennis court and a gym. This villa is designed to maximize ocean views, with expansive windows and sliding glass doors throughout. A 12’ high waterfall made with split-face travertine is the highlight of the interior. The spaces inside The Beach House are contemporary and open, with vaulted ceilings and all-white interiors. The kitchen is equipped with the best brand-name appliances and opens out to the poolside terrace. Plus, there’s a luxurious media room with seating for twelve, a bar top, and a large home theatre. The nearby game room has a billiards table, chess, board games, basketball hoops, and air hockey. All eight suites have incredible ocean views, an ensuite bathroom, and a king bed. The first floor suites each have exterior access to the balcony, and most of them have an outdoor shower. There’s four bedrooms on the ground floor, and one has a king sofa bed. The Beach House has a separate apartment building at the back of the house, which has a master suite and an open concept living/kitchen area. The Beach House boasts some of the best dining on Anguilla, and the chefs are renowned throughout the Caribbean. There’s also an onsite manager, housekeeper, security, butler, and a laundress to maintain the home. Groceries and restaurants are two minutes away. Upon arrival guests will be met by a taxi driver who will drive you to the villa (guest expense). If you have rented a car, it will be delivered to the villa. Car rental, grocery and beverage shopping (pre-arrival and during your stay), liquor and wine delivery, nanny service, baby equipment, spa services, yoga and personal training, photography, and private airport transfer/car service can be arranged for an additional fee. Food and beverages will be charged at cost + a 15% administration fee. Discount of 10% off rental rate. Applies to bookings 7 nights or more. Good for stays from Mar 8, 2019 to Apr 30, 2019.